Have you heard of Cedar Island Selects and Petites, Ninigret and Charleston Cups, East Beach Blondes, Matunuck and Potter Moon Oysters, Moonstone Oysters, Rome Point Oysters or Wild Goose Oysters? All are farm grown in salt water ponds along the shores of Rhode Island and gathered under one roof at the Ocean State Shellfish Co-op. “Where the Oysters Are” is the quote of the Co-op, and that is no lie. The Ocean State Shellfish Co-op is where the oysters are. Call ahead and order three, four, five or more dozen, and ask for a variety and have an oyster tasting right on board. For while all of the oysters start from the same seedlings, it is the nature of the water in which they are grown which give each variety a different flavor all their own. Watch the video of Master Shucker and co-op organizer, Graham Brawley as filmed by Jose de Guzman of the Fishmonger’s Seafood Guide. Raw oysters with their fresh taste evocative of the sea are best eaten right after opened, right on the half shell. And, of course, should be kept cold until opened. An experienced person at opening oysters can open an oyster in less than 10 seconds. 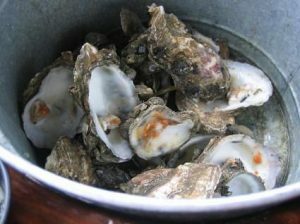 Rhode Islanders tend to like to eat their fresh raw oysters with a squeeze of lemon and a bit of horseradish tomato based seafood cocktail sauce, sometimes right out of the shell or slid onto a saltine cracker. 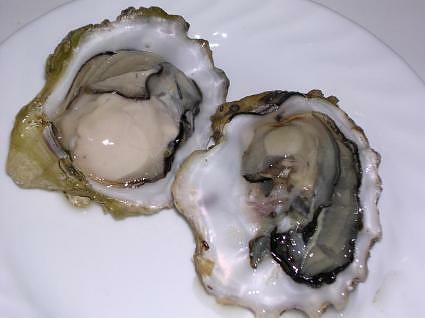 If you have flown in from Europe, you will probably like your fresh raw oysters with a little mignonette sauce made generally from flavored vinegar of your choice, chopped shallots, salt and pepper. Here are Northrop and Johnson Yacht Charters; we have become a regular customer.